Whether you’re reading a book, trying to get some work done, or relaxing with a G & T, our range of garden sun loungers offer you plenty of options. When you’ve worked hard in the garden all year why not take some time to just lie back and enjoy the fruits of your labours? At Lazy Susan, we have a number of sun loungers in an array of finishes, from the classic cast aluminium in antique bronze or white, to the new modern range in aluminium and textiline, in a choice of brown, black, grey, or the super-chic white/grey mix. New for 2017, the Michelle sun lounger has been introduced to the range because of its sleek lines and contemporary appeal. With a reclining seat back and plenty of room to stretch out, this minimalist new sun lounger would be a stylish addition to any garden or patio. Alternately the Lizzie sun lounger in cast aluminium, which combines durability and resilience, has long been a popular choice. Our metal sun loungers won’t rust or rot, they can live outside all year. 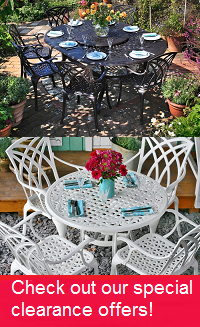 Put your feet up and read a book or snooze in the sunshine and enjoy the best of the British summer from the comfort of a Lazy Susan garden lounger. We love hearing from you and answering any questions you may have about garden sun loungers or other garden furniture pieces, so please give us a call on 01243 717197.